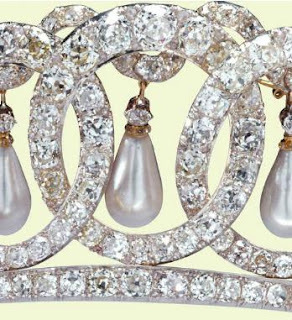 Coming in at number 6 on your list of favorite tiaras is a piece that could warrant a spot based on its story alone. Add in the fact that it comes with two different kinds of stones to swap out and its overall exquisite craftsmanship, and you’ve got yourself a winner. Grand Duchess Vladimir (also known as Grand Duchess Maria Pavlovna of Russia, wife of the Grand Duke Vladimir Alexandrovich) was the aunt of Tsar Nicholas II, who was murdered alongside his family in 1918 by the Bolsheviks. Grand Duchess Vladimir was the grandest of the grand duchesses at the royal court, and she was no fan of the Tsar’s wife, Alexandra. So she packed up her magnificent jewel collection and set up a rival court at which she could properly dazzle. One of her most dazzling pieces was this tiara of 15 intertwined diamond circles strung together with a diamond ribbon on top and hung with articulating pendant pearls, made in the 1874 by Bolin, the Russian court jeweler. She hid this wonderful example of intricate Russian craftsmanship in the vault at Vladimir Palace in 1918 when she fled St. Petersburg in the wake of the revolution. It remained hidden away until a friend of the family who happened to be a member of the British Secret Intelligence Service smuggled the jewels out of Russia for the Grand Duchess, tucked away in a plain bag. 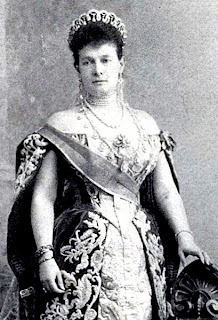 With her jewels finally returned to her, she split them up amongst her four children before passing away in Paris in 1920. This tiara went to her daughter, Princess Nicholas of Greece. Princess Nicholas sold her jewels to benefit both her family and Russian charities, and she sold this one in 1921 to Queen Mary. Mary subsequently had to have some repairs completed, as the journey hadn't been kind to the fine craftsmanship. It was inherited by Queen Elizabeth on Mary’s death in 1953 along with the rest of her remaining jewel collection. 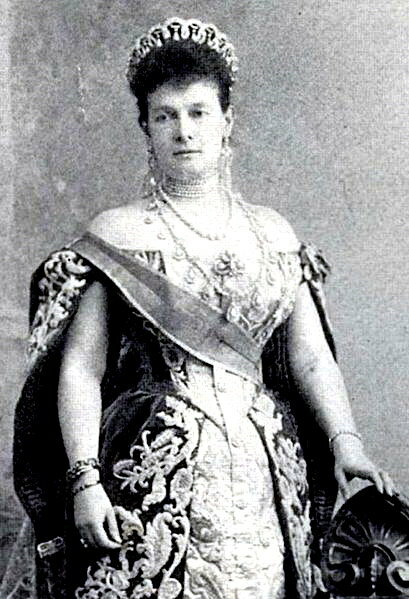 A quick word on its Russian provenance, as this always brings up accusations that Queen Mary swindled her poor exiled relatives (and you can find evidence both ways, that she did wrong and that she didn't): the debate mainly relates to jewels that were delivered to Grand Duchesses Xenia and Olga that Mary and George were meant to be helping value and sell. This tiara does not belong to that group, as it was bought separately from Princess Nicholas. In Part 2 of De Kongelige Juveler, you can see a written record of the purchase; we learn that the tiara was sold to Mary along with a diamond riviere for a price of £28,000 with all but £3,000 paid at the time of writing. Anyway, once in Queen Mary’s hands, of course she couldn’t leave it alone. 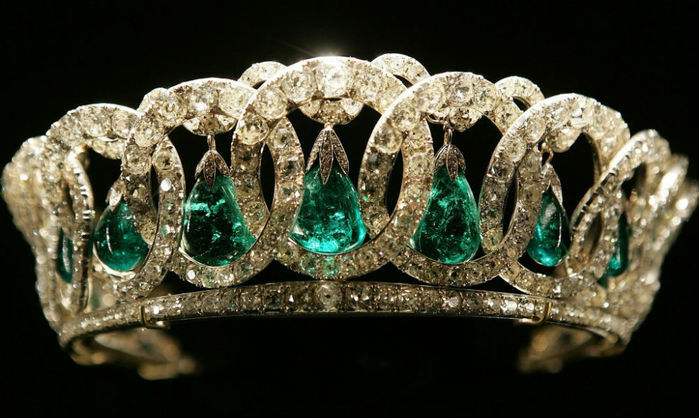 Mary was in possession of the Cambridge emeralds, a group of around 40 cabochon emeralds which had originally belonged to Indian royalty but had made their way into British hands before being auctioned at a charity ball in 1818. The winner of the auction was Queen Mary’s grandmother, the Duchess of Cambridge. Once acquired by Mary, the emeralds were incorporated into new and existing royal pieces. To the Vladimir tiara, she added 15 stones which originally topped the Delhi Durbar Tiara as an alternative to the dangling pearls in 1924. It was a pretty ingenious idea, actually, as it made a nice mid-sized tiara option to wear alongside the fabulous collection of emeralds that she had once she combined the Cambridge stash with emeralds collected in India during the Delhi Durbar. 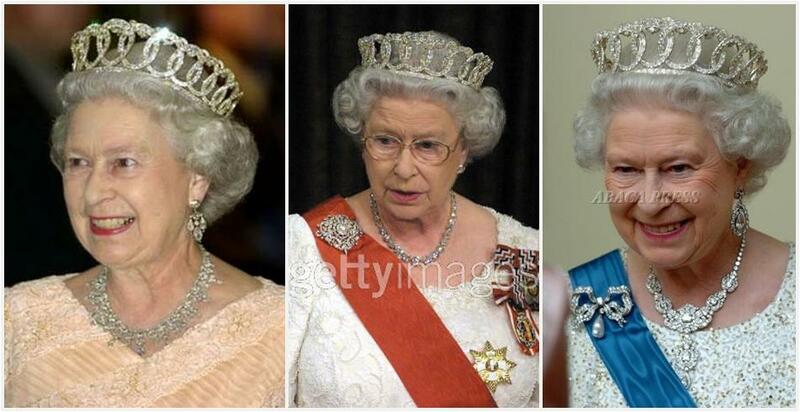 The Queen has worn this a few times in a third version, with no pendants at all. While I’m sure this is easier to wear (lighter, no stones swinging around as the emeralds or pearls would do), I’m afraid it looks like just what it is: a tiara with missing pieces. Perhaps because of its versatility, it has become one of the Queen’s favorite tiaras. She seems to prefer the pearl version - no doubt, she has plenty of pearl accessories to pair it with. In the 1980s, she had the deteriorating silver mount redone in sturdy yellow gold to hold up to her frequent usage. While this tiara wouldn’t pop to the top of my own favorite tiara list, I wouldn’t turn it away either (obviously). I’d take it and I’d add even more pendant options to it, is what I’d do. There’s a similar tiara of Spanish royal provenance that uses aquamarines to great effect, but I'm thinking amethysts are what we need here. Did this make your list? If so, why?